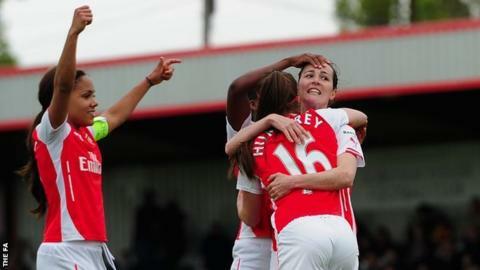 Natalia Pablos Sanchon scored twice to help Arsenal overcome Sunderland, who finished with 10 players. She put them ahead with an early curled effort, which went in off the post, before Beth Mead lifted the ball over the onrushing Emma Byrne to level. Natalia had an effort tipped onto the bar before adding a second from the penalty spot after Abby Holmes saw red for bringing Kelly Smith down. Carla Humphrey added a third from close range and Danielle Carter made it 4-1. Smith, who came off the bench to replace Lianne Sanderson in the second half, lasted just seven minutes on the pitch as she was helped off injured after Holmes' challenge. Sunderland suffered two injury setbacks of their own in the first half as Keira Ramshaw was forced off after 15 minutes, and Rachel Furness failed to return after the break. Second-placed Arsenal next face Women's Super League leaders Chelsea on Thursday. Substitutes not used: Augustus, Yankey, Weir, Kelly. Substitutes not used: Wilson, Gutteridge, Bass, Harkness.